There is no question after Week 6 that the Oakland Raiders are the real deal this season as they have now won four games in the first six weeks and already have half as many wins as they did last season. With the running game firing on all cylinders with Pro Bowler Darren McFadden leading the way and the defense playing much better than anticipated, the Raiders seem to be destined to compete for a playoff spot in the AFC Conference this season. Not only might they get back into the playoffs for the first time since 2002, but they have a great chance of competing for the AFC West division title with only the San Diego Chargers standing in their way. In Week 6, the Oakland Raiders were able to make easy work of another up-and-coming team in the Cleveland Browns, but it came at a cost as they have now lost starting quarterback Jason Campbell to a broken collarbone. The injury has not ruled Campbell out for the season, but he could miss about six weeks since the injury will require surgery. 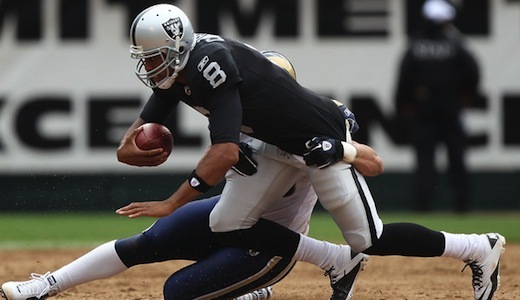 With no real viable backup in Oakland since the Raiders have no faith in Kyle Boller or rookie Terrelle Pryor, the storied franchise has already started looking elsewhere for a short-term and possibly long-term replacement for Jason Campbell. Before this NFL regular season began, the Oakland Raiders were considering making a move to bring in another quarterback since big-name like Kevin Kolb (Arizona Cardinals), Donovan McNabb (Minnesota Vikings), Alex Smith (San Francisco 49ers) and Carson Palmer (Cincinnati Bengals) were reportedly up for grabs. Obviously, three out of these four either found new teams or stayed where they were, but Carson Palmer was the exception. Reportedly, the Oakland Raiders have shown interest in three veteran quarterbacks thus far. The first quarterback the Raiders were courting was former Jacksonville Jaguars longtime gunslinger David Garrard who has been looking for the right place to land since being released before the season began. Unfortunately, Garrard just had surgery to repair a herniated disk and will be unavailable to sign. It is a shame that the timing didn’t work out because Garrard might have been the perfect fit in Oakland. Now that Garrard is off the table, the Raiders have reached out to free agent Josh McCown and have gone after Carson Palmer. The best option now for the Oakland Raiders is Carson Palmer since the Cincinnati Bengals seem content with rookie quarterback Andy Dalton who has played much better than anticipated in his first year in the NFL, but the Bengals still seem reluctant to let Palmer go up to this point. With Bengals owner Mike Brown still standing firm about not trading Carson Palmer since he did live up to his end of the bargain, the Raiders acquiring the former Heisman trophy winner and California boy might be a longshot, but now it is a reality.